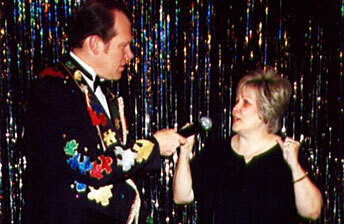 Game shows are entertaining for everyone and a fabulous way to interact with your audience! Categories can be pre-selected and customized questions are always welcomed. Add a comedic emcee and you have 60 to 90 minutes of laughter, good times and memorable moments. Audio clips with music, sound effects and quotes will give everyone’s thinking cap a workout. This package includes P.A. 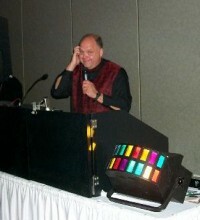 and music for up to 100 people with 4 game show consoles. Your combination of Host/Engineer will really get them going. Custom games, questions and categories can be written for any group or theme. This extravaganza features stage lighting and a shimmering backdrop. Interactive props, costumes and dances allow the trivia impaired to score and entertain. Belly Basketball, Team Tetherball, Hula Hoops and Limbo are just a few of the physical challenges available. Throw in the giant audience cue cards to really rev up the crowd! This show is complete with P.A and music for up to 350 people and includes up to six game show consoles. Similar to their famed Television counterparts, these shows are great for team- building, after-dinner entertainment or for corporate messaging. The following game shows are projected on a screen.